Seasonal timing, or phenology, determines how an organism’s life history unfolds over the course of a year. When environments fluctuate seasonally, natural selection on a particular trait depends on position within a calendar year. For example, organisms with complex life cycles may time active life history stages so that they occur only during the warmer periods of a temperate year, synchronizing dormant stages with harsh, winter conditions. The pitcher plant mosquito Wyeomyia smithii, for example, overwinters as a diapausing larvae in the water-filled leaves of the purple pitcher plant, Sarracenia purpurea. 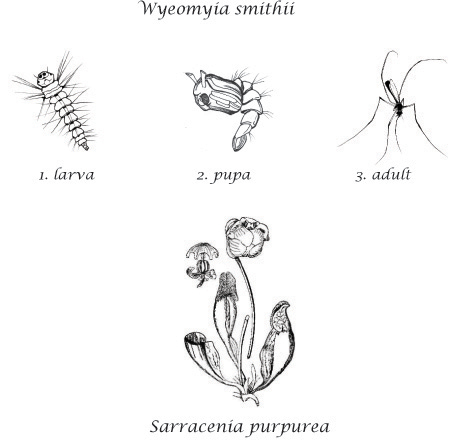 Wyeomyia smithii life cycle and seasonal cycle of average temperatures. Figure depicts a northern univoltine cycle: southern populations are multivoltine. As ectotherms, insect growth, performance, and reproduction are highly temperature-dependent, making environmental temperature an important agent of natural selection. Active growth and reproduction takes place primarily during the summer, and any selection imposed during active life history stages depends on temperatures experienced only between diapause termination and initiation. Thus, changing the timing of diapause initiation or termination changes temperature-mediated selection on non-dormant (active) life history stages. We generally expect that higher latitude or altitude populations of a broadly distributed species will be more cold adapted because average temperatures decline with increasing latitude and altitude. Likewise, we expect the opposite trend for heat adaptation. Timing of diapause often evolves along geographic clines, however, affecting expected trends in selection. For example, evolved differences in diapause timing cause geographically disparate populations of pitcher plant mosquitoes to experience fairly comparable low temperature exposure during times when they are actively growing and reproducing. Annual distributions of daily minimum temperatures at field sites in Florida, coastal and montane North Carolina, and Massachusetts for the entire year and the growing season only. The growing season is defined as the period of the year between diapause termination and diapause initiation. We are interested in how this interaction between seasonality and natural selection affects the evolution of both life history timing and thermal adaptation. These interactions appear to also play an important role during seasonal shifts and host shifting in Rhagoletis pomonella, informing many of our projects on Rhagoletis population divergence and adaptation. 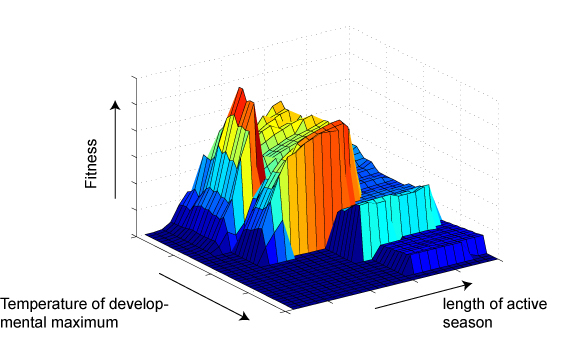 More generally, ongoing efforts in meta-analyses and optimality modeling suggest that 1) greater latitudinal predictability of the timing of seasonal transitions compared to annual average or extreme temperatures may explain observed latitudinal patterns of thermal physiology and dormancy timing, and 2) although fitness surfaces may be rugged, seasonal timing and thermal parameters may have equivalently large effects on fitness. Relationship between fitness, length of growing season (i.e, timing of dormancy), and temperature of maximum developmental rate (the temperature at which a curvilinear function relating development rate to temperature is maximized) in a model simulating a multivoltine population of pitcher plant mosquitoes in a seasonally variable thermal environment.